Paddington Bear Stacking Rings Discounts Apply ! 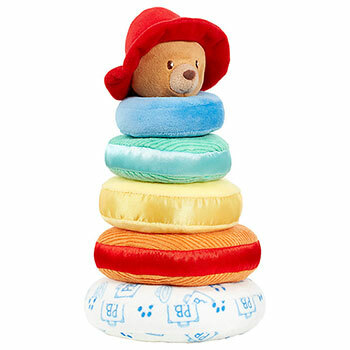 The adorable Paddington for Baby Stacking Rings toy is tactile, colourful and fun! The nursery toy features a baby soft Paddington Bear with squeaker sitting on top of stackable plush rings. .
With multiples textures jingles and crinkles to entertain, this colourful soft toy will also help little ones with colour and size recognition.Perfect for inspiring imaginative play amongst young minds, it also helps teach children about the world around them while helping to develop their fine motor skills. .